One of the best ways I’ve discovered to feel more organized and less frazzled in the afternoons and evenings is to have a plan for dinner and have it already made before the kids come home from school. That way, when they come home, I can just be present with them instead of trying to fix dinner and oversee homework and help kids with projects and get ready for whatever activities we have in the evening. Plus, it also saves us money because we’re not running to the store or through the drive-thru at 5:30 p.m. at night! I’ve found that the best way to make this happen is to either have dinner already made and just needing to be heated up or to put dinner in the crockpot in the morning. 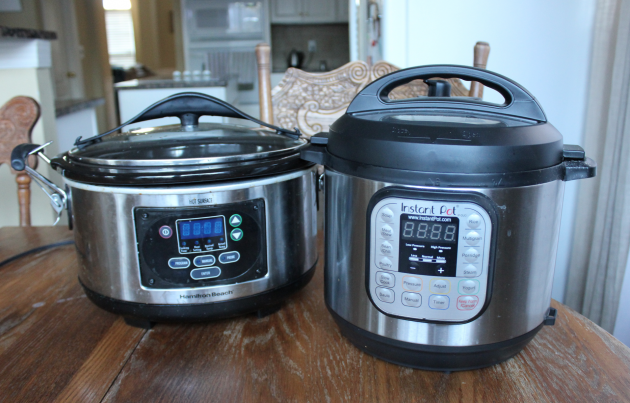 I look for quick and easy meals that only take minutes to make in the morning or can be pulled out of the freezer and heated up in the Instant Pot or Crockpot or oven. Want to Try Prepping Your Dinners in the Morning? I want to challenge you to try implementing this habit of having dinner prepped in the morning in your home and see how it works for you. And to help you out, I’m going to do a fun Eat at Home challenge on my blog and on Facebook Live and Instagram Stories for the next 6 days — where I’ll be prepping our dinners on live video before we head to school in the mornings (I’ll be on live around 6:50-7:10 a.m.). I’ll likely be in my workout clothes with no makeup on and the kids will be doing last-minute prep for school. It’s going to be real and raw and unedited… and I can guarantee there will likely be some mishaps or real-life scenes that take place. But I want to bring you into our morning and our kitchen to encourage you that you don’t have to do it perfectly for it to still make a big difference! By the way, I’ll be using the Eat at Home Menu Planning Service for all of my recipes. If you wish you could simplify dinners and plan ahead but you feel like you just don’t know what to make or you don’t have time to plan meals, I highly recommend this Menu Planning Service. I tried them out for the first time last year and promptly fell in love! The challenge will run for 6 days — September 13-18, 2018. 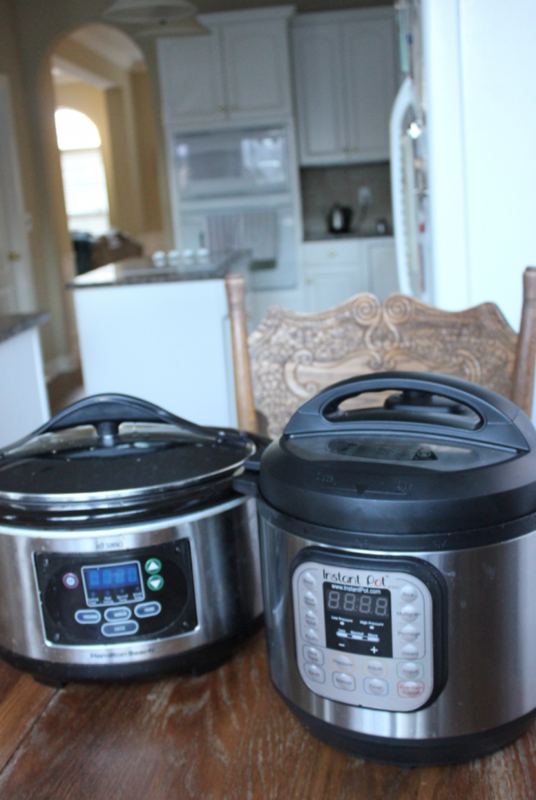 Thursday, Friday, Monday, and Tuesday morning around 6:50 a.m. to 7:10 a.m. CT, I’ll be on Facebook Live prepping our dinner to throw in the slow cooker for the day so that when 6 p.m. rolls around dinner is READY! Need Some Quick & Easy Recipe Ideas? 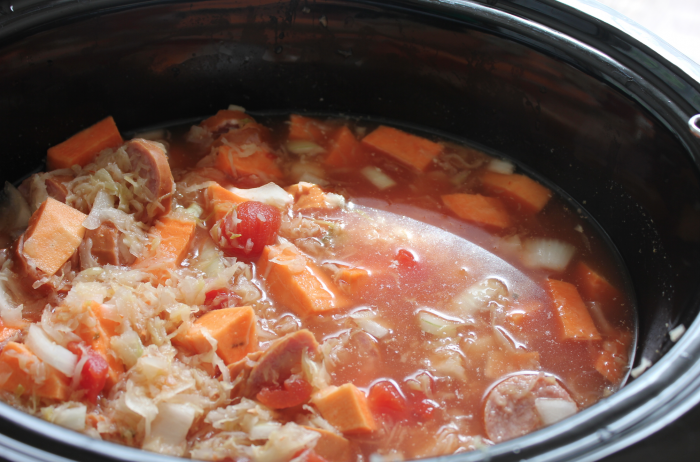 Like I said, I’ll be following the Eat at Home Cooks Slow Cooker Menu Plan. I love this menu planning service and I think you’ll see why after you watch my videos! 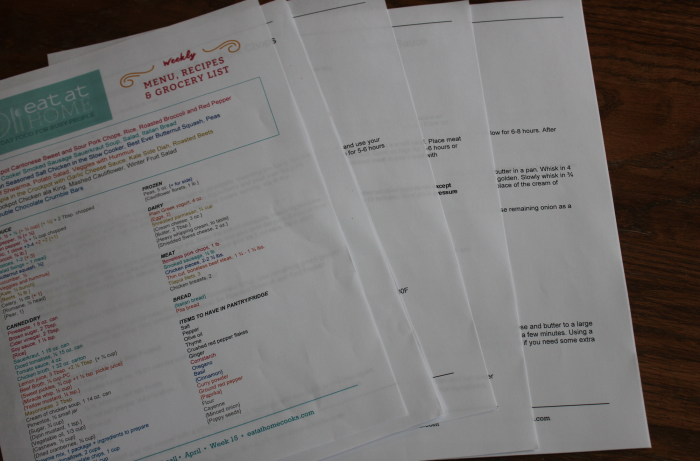 It’s the best menu planning service I’ve ever tried — and I’ve tried quite a few different ones! 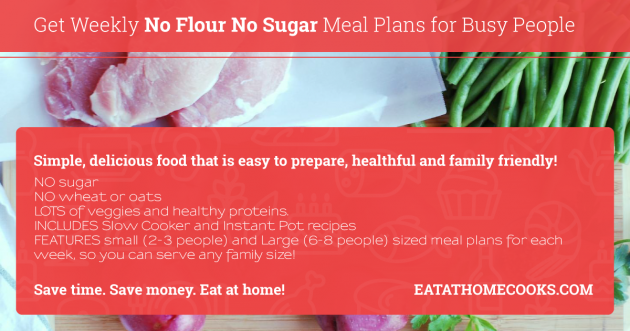 You can choose to stick with just the traditional menu plan or just the slow cooker menu plan or just the whole foods menu plan or just the No Flour, No Sugar plan. Or, you can rotate different menu plans on different weeks, depending upon what you feel like cooking or how much time you have! 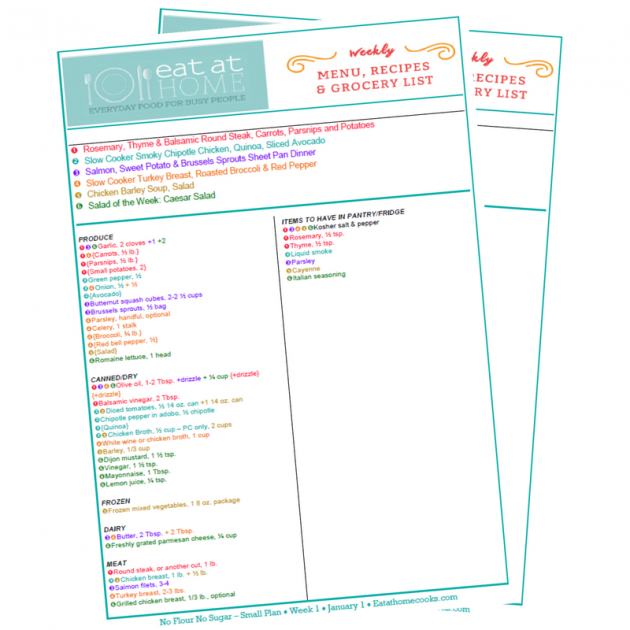 If you struggle to make menu plans and would love for someone to make them for you + make a grocery list for you, it’s well worth spending a few dollars every week to let Eat at Home Cooks do the work for you. Go read more about this incredible menu-planning service here. I know that many of you are in the middle of getting back into rhythms and routines after summer break so I hope this Eat At Home Challenge will inspire you with simple and easy meals that you can make in the morning before your kids head out the door to school or before you head to work or before you start your day and then you won’t have to think about dinner the rest of the day! 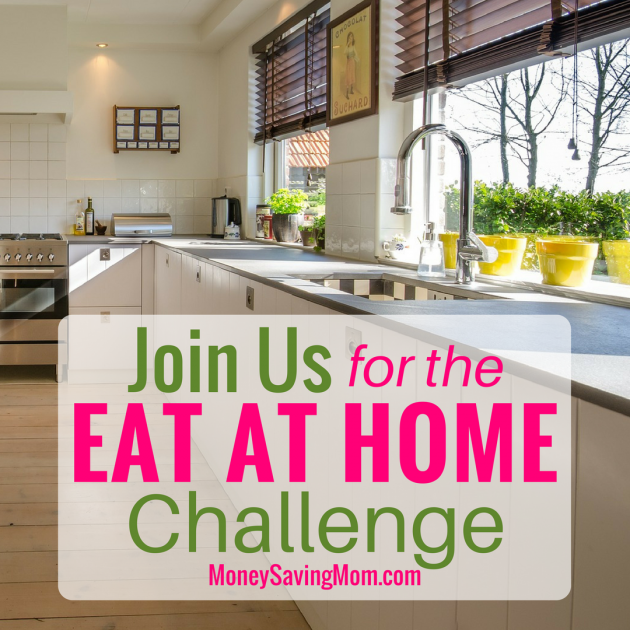 Are you joining us for the Eat at Home Challenge? If so, leave a comment and let us know! I’m excited to participate in this challenge with basketball games and football practices my afternoons are extremely busy. I do find myself running around prepping dinner while the boys get homework done before we all have to rush out the door for a sport practice or game. I’m late to the party, but joining in now. My family needs this terribly. I hope to grt buy in from everyone so we can all pitch in (my girls are 15 & 17 and home a couple of hours before me everyday).